Best video converter, DVD ripper, iPad/iPhone/iPod transfer software to easily convert DVD/video and transfer file for iPad/iPhone/iPod. 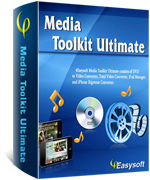 4Easysoft Media Toolkit Ultimate is best and powerful software packed with DVD to Video Converter, Total Video Converter, iPod Manager, and iPhone Ringtone Converter. AS the best Video Converter software, 4Easysoft Total Video Converter can convert all popular video files freely. You can use it to convert video to video and convert video to audio. 4Eeasysoft HD Converter can easily convert HD video to HD video, convert HD video to general video and convert between general video. You can also use this HD video to convert general video to HD video with perfect quality. As the best iPad transfer software, 4Easysoft iPad Manager can help you transfer iPad files to PC and transfer PC files to iPad freely. You can also use this iPad transfer to transfer files for iPhone, iPod, etc. Apple devices. With 4Eeasysoft DVD Converter Platinum, you can freely convert DVD to the video formats you want, such as convert DVD to MP4, convert DVD to AVI, etc. 4Easysoft DVD Copier for Mac is the best Mac DVD Copier, Mac DVD Copy to copy DVD to DVD, DVD folder, ISO file and burn local contents to DVD on Mac. 4Easysoft iPad Mate, brilliant pack software for iPad fans, contains DVD to iPad Converter, Video Converter for iPad, iPad Manager, iPhone Ringtone Converter and iPhone Transfer SMS. 4Easysoft Free MP4 Converter is a Free MP4 Video Converter, which is designed to convert video formats to MP4 in an easy and fast way. In addition, the Free MP4 Video Converter can also convert video to audio and convert audio to audio freely. 4Easysoft Free MOV Converter is a free MOV Converter, free QuickTime MOV Video Converter, which has the ability to convert MOV to other popular video and audio formats with high speed and quality.